KUALA LUMPUR: Sime Darby Property Bhd has been recognised as an index component of the Dow Jones Sustainability Indices (DJSI), after obtaining a good sustainability score that qualified it as an index constituent in the Dow Jones Sustainability Emerging Markets Index. In a statement yesterday, Sime Darby Property said the recognition was announced by S&P Dow Jones Indices and RobecoSAM AG, the investment specialist focusing on sustainability investing. The Dow Jones Sustainability Emerging Markets Index comprises emerging market sustainability leaders, as identified by RobecoSAM, which represents the top 10% of the largest 800 companies in 20 emerging markets, based on long-term economic, environmental and social criteria. Sime Darby Property said it was the only real estate industry player from Malaysia to be included in the index, alongside other property players from the Philippines, Thailand, South Africa and Chile. 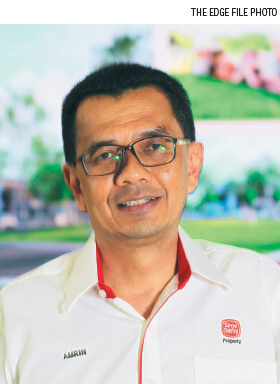 Its group managing director Datuk Seri Amrin Awaluddin (pic) said the recognition proves its commitment over the years to sustainability by embedding such practices in it business value chain. “This is a truly great honour for the Sime Prop (Sime Darby Property) team. It is an important milestone in our sustainability journey and we could not have achieved this without the support of our employees and stakeholders,” Amrin added. Sime Darby Property said sustainability is an important agenda for the group. He added its initial focus on operational efficiency was strengthened by corporate social responsibility efforts and has been expanded to embed sustainability into its business practices. “As a developer of large-scale developments and townships, SimeProp delivers impactful townships that last for generations, while minimising any negative impact on the environment. RobecoSAM environment, social and governance ratings head Manjit Jus said companies that compete for a place in the DJSI challenge themselves to continuously improve their sustainability practices. At 10.47am, Sime Darby Property dipped one sen or 0.84% to RM1.18, with 483,300 shares done, with a market capitalisation of RM8.16 billion.